Good Morning from Long Island where we are anticipating Hurricane Sandy! We had a nice week last week. Field Hockey games are winding down. And we went to the fall fair at the kids old school where someone won a serious amount of candy corn! This smart girl was able to guess that there were 407 candy corn in the container she is holding. Two years ago, she won 920 skittles! I can't believe how much she has grown in those 2 years! 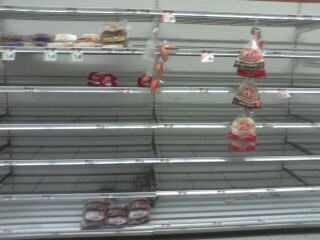 And what the bread shelves look like at the stores. Anyone got any white bread? We plan on staying in our home unless it gets real bad. Our electric company called last week to let us know if we lost power, expect it to be 7 to 10 days! How are you doing on this fine Monday? Link up below and grab the button from my sidebar. Stay safe! We are going to try to take a ride to check out The Sound to see how it is. So far it is really windy. I baked a bunch and am hoping the power stays on. Newest follower here! I found you through the Monday link up! Cute blog, I can’t wait to read more!